Chicken, bacon and lettuce Chicken breast, sweetcure bacon, seasoned mayonnaise and lettuce in malted bread. Egg and Cress Hard boiled egg, mayonnaise and salad cress in malted bread. Prawn Mayonnaise Prawns and mayonnaise in white bread with oatmeal. Cheese and Onion Mature Cheddar cheese, Red Leicester cheese, onion and seasoned mayonnaise in white bread with oatmeal. 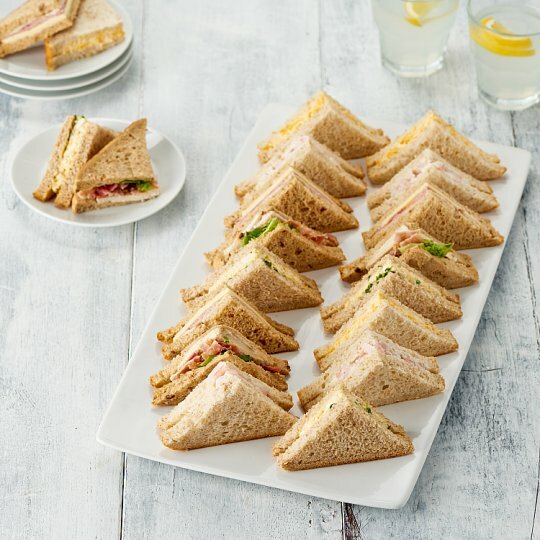 Smoked Ham and Cheddar Smoked ham formed from selected cuts of pork leg, mature Cheddar cheese and mayonnaise in malted brown bread. Wheat Flour (Wheat Flour, Calcium Carbonate, Iron, Niacin, Thiamin), Smoked Ham Formed from Selected Cuts Of Pork Leg (23%), Water, Mature Cheddar Cheese (Milk) (17%), Malted Wheat Flakes, Rapeseed Oil, Wheat Bran, Wheat Gluten, Cornflour, Spirit Vinegar, Yeast, Salt, Malted Barley Flour, Pasteurised Egg Yolk, Emulsifiers (Mono- and Di-Glycerides of Fatty Acids, Mono- and Di-Acetyl Tartaric Acid Esters of Mono- and Di-Glycerides of Fatty Acids), Sugar, Malted Wheat Flour, Flour Treatment Agent (Ascorbic Acid), Palm Oil. Smoked Ham Formed from Selected Cuts Of Pork Leg contains: Pork, Salt, Dextrose, Stabiliser (Sodium Triphosphate), Antioxidant (Sodium Ascorbate), Preservative (Sodium Nitrite). Chicken breast, sweetcure bacon, seasoned mayonnaise and lettuce in malted bread. Wheat Flour (Wheat Flour, Calcium Carbonate, Iron, Niacin, Thiamin), Chicken Breast (20%), Water, Sweetcure Bacon (15%), Lettuce, Malted Wheat Flakes, Rapeseed Oil, Wheat Bran, Cornflour, Wheat Gluten, Spirit Vinegar, Yeast, Salt, Malted Barley Flour, Pasteurised Egg Yolk, Emulsifiers (Mono- and Di-Glycerides of Fatty Acids, Mono- and Di-Acetyl Tartaric Acid Esters of Mono- and Di-Glycerides of Fatty Acids), Sugar, Malted Wheat Flour, Flour Treatment Agent (Ascorbic Acid), White Pepper, Palm Oil. Sweetcure Bacon contains: Pork Belly, Sugar, Salt, Emulsifier (Sodium Triphosphate), Honey, Preservative (Sodium Nitrite). Prawns and mayonnaise in white bread with oatmeal. Prawn (Crustacean) (33%), Wheat Flour (Wheat Flour, Calcium Carbonate, Iron, Niacin, Thiamin), Water, Rapeseed Oil, Oatmeal, Wheat Bran, Spirit Vinegar, Salt, Pasteurised Egg, Yeast, Pasteurised Egg Yolk, Wheat Gluten, Emulsifiers (Mono- and Di-Glycerides of Fatty Acids, Mono- and Di-Acetyl Tartaric Acid Esters of Mono- and Di-Glycerides of Fatty Acids), Sugar, Malted Barley Flour, Palm Oil, Flour Treatment Agent (Ascorbic Acid). Hard-Boiled Egg (37%), Wheat Flour (Wheat Flour, Calcium Carbonate, Iron, Niacin, Thiamin), Water, Rapeseed Oil, Malted Wheat Flakes, Salad Cress, Wheat Bran, Wheat Gluten, Spirit Vinegar, Yeast, Salt, Malted Barley Flour, Pasteurised Egg Yolk, Pasteurised Egg, Emulsifiers (Mono- and Di-Glycerides of Fatty Acids, Mono- and Di-Acetyl Tartaric Acid Esters of Mono- and Di-Glycerides of Fatty Acids), Cornflour, Sugar, Malted Wheat Flour, Black Pepper, Flour Treatment Agent (Ascorbic Acid), Palm Oil. Mature Cheddar cheese, Red Leicester cheese, onion and seasoned mayonnaise in white bread with oatmeal. Wheat Flour (Wheat Flour, Calcium Carbonate, Iron, Niacin, Thiamin), Water, Mature Cheddar Cheese (Milk) (12%), Red Leicester Cheese (12%), Onion (8%), Rapeseed Oil, Oatmeal, Wheat Bran, Cornflour, Spirit Vinegar, Pasteurised Egg Yolk, Salt, Yeast, Sugar, Wheat Gluten, Emulsifiers (Mono- and Di-Glycerides of Fatty Acids, Mono- and Di-Acetyl Tartaric Acid Esters of Mono- and Di-Glycerides of Fatty Acids), Malted Barley Flour, Palm Oil, Flour Treatment Agent (Ascorbic Acid).